We cannot change the outer experience until we change the inner experience. Everyone on this planet has freewill. It is our freedom to choose how we respond and experience something, but until we are aware of how we are responding to something we cannot be in the driver’s seat to go where we want to go. Until you release the fear that conditions the response, you cannot change the action that creates the situation with your horse. Read it again. Very often once we really come to know and have a clear picture of what we want, the next thing we immediately try to do is find out how we can make that happen, we want to know what it is we need to do. Taking action can only happen once we understand and clear out what has prevented us from taking action in the first place. Inertly we know what we want but are still stuck in the same repeated situations with our horse. When we are ‘blocked’ in some way more ‘doing’ only fills up the blockage even further. It is in this time that ‘unblocking’ needs to take place in order for the way how to be able to flow through. Picture in your mind that you have a cup full of orange juice, this orange juice has begun to go sour. You once saw someone else with a cup of milk and after trying a bit of theirs you realised how nice that milk was and now you know you would love to have a cup of milk. The thing is though, you only have the one cup. Now imagine that you start filling this already full cup of orange juice with milk. What happens? All it does is overflow. You never get to taste the milk because it doesn’t fit in the cup, the small bits you do manage to taste are spoiled by the sour juice mixed in it. You have the milk, this beautiful creamy, cold fresh milk but you never get to taste it because your cup is already full! Empty your cup before you try to fill it with something different. A great part of awareness is the process of emptying your cup of things you no longer need anymore. The challenge with confronting what is currently stopping us means we may have to face painful issues about ourselves that we have pushed to the side for a long time, but when things keep getting worse they are actually helping you confront these fears. If you don’t know what is stopping you, how can you move it out of the way? Most of the time we know we are afraid of something but don’t feel that it is stopping us in any way and are happy to live with it, but fear in any area of your life is like one rotten apple that eventually affects every other apple in the bowl. Awareness of where the rotten apple is sitting in the bowl helps you take it out leaving you with the other apples to use as you desire. If right now you are afraid to go looking for that rotten apple, then you are closer to its smell and the process of getting rid of it has already begun. 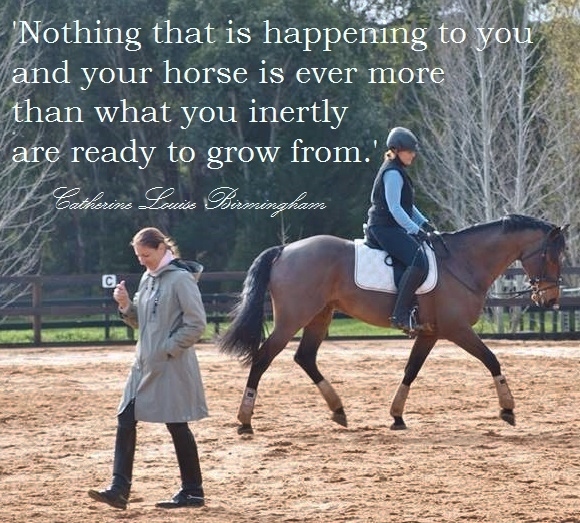 You have come very far, nothing that is happening to you and your horse is ever more than what you inertly are ready to grow from. Locating the apple is the hard part once you have found it is then very easy to take it out. Understand and be aware first of what is stopping you at the moment before you start to focus on what to do. The next step is with you right now, all you need to do is listen. Overcoming fear actually leads us to more capabilities than ever before. In other words, without creating and confronting fears in our life we do not become aware of our abilities and strengths in other areas. The blind man hears more than the person who can see. Fear is like the blind man, it is restricting in some way but actually helps us grow in another way. You draw upon areas of yourself that have always been there but were never needed because you never gave it an opposing force. Growth in any area always requires an opposing force. When you sit in your comfort zone you limit your experience of who you are and what you can do, you haven’t challenged yourself to grow. This is not a bad thing it just means that when you come to a point in your riding that you would like to experience more, then that requires an opposing force. 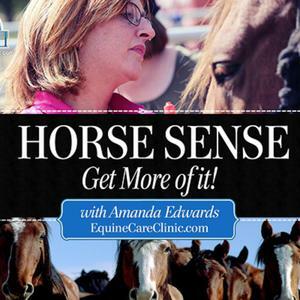 Fears have been sitting there in some way or form but are just bubbling up to the surface when you start to ask more from yourself and your horse. Have you noticed things very often get worse in some way or form before they get better? These challenges don’t create fear they just bring it to your awareness. When you are aware of them and they slowly leave you, you are not less of a person without them you are actually becoming more whole. It’s like the areas that fear were sitting in were blocking off a flow of information to you about yourself. Imagine you are a dried up dam with all these rivers of water from the mountains connected to you, but the flood gates of fear at the entrance of each of these rivers, are closing off the flow of water to you. Every time you break open one of these gates not only do you fill up with more water but you are more than just the dam, you become the rivers connected to the mountains that are connected to the rain, the sky and the world. You realise that you are not just a dam you are part of the whole world. A skilled rider does not grow a new body to do the things they are able to do, they grew from the inside out using what they had, but with awareness of their own potential, they gave it power. Everyone is different and some have more rivers blocked off than others, but if you are aware of any block you have about anything, regardless of how small or insignificant you think it to be, then you are just one step closer to a grander, connected and more filled up you! 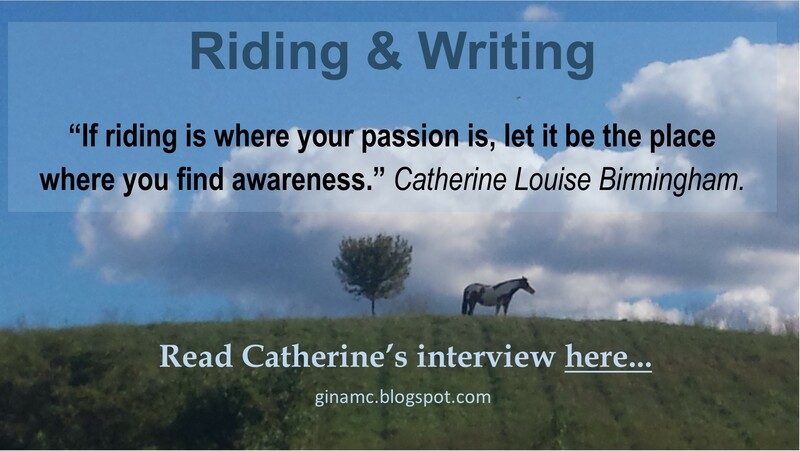 Catherine has successfully trained numerous horses in Germany, Japan, Australia, Indonesia and Singapore. She has taught and coached riders in three different languages. 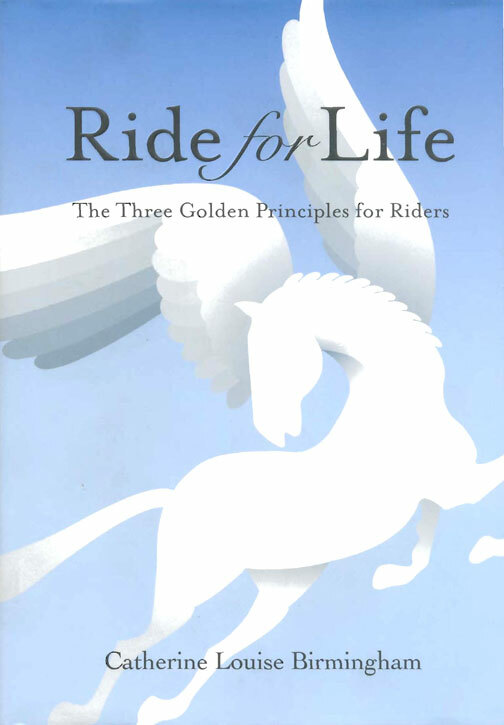 Her book, Ride for Life, is selling throughout Australia and is now translated into Danish with foreword from Princess Nathalie as well as Italian. Catherine Louise Birmingham lived and trained in Germany for four years and then had her own training Stables in Australia. Although she specialises in classical German Dressage she also works with confidence building and all levels of riding, her coaching is unique in that it spreads across deeper areas of Spiritual growth, healing and awareness within the individual. Catherine Is now available to give Energy Readings and Spiritual Guidance Sessions via WhattsApp, Skype or Email! Go to Healing & Coaching with Catherine to book your session.